Cuyamungué, New Mexico, is located approximately fifteen miles north of Santa Fe. Between the Sangre de Cristo Mountains in the east and the Jemez Mountains in the west flows the Rio Grande. Near the Pueblo of San Ildefonso the Rio Grande is joined by the Pojoaque River, and the Pojoaque is then joined by the Rio Tesuque which was once known as the Rio Cuyamungué. The Cuyamungué Indians were of the Tewa language group. The name “Cuyamungué” is a Tewa geographical name meaning “pueblo ruin where they threw down the stones.” Native Americans often name places for physical landmarks with which they are familiar. This name refers to a hill where huge stone boulders are “thrown down.” Today it is known as, “the hill where the stones are slipping.” Cuyamungué is spelled many different ways in the literature: “Cuyammiqué,” “Cuyo Monque,” “Cuyamanque,” “Cuya Mangue,” “Cuyamonge,” Ku Ya-mung-ge,” and “Kyamunge.” The Cuyamungué Indians subsisted by hunting and gathering, and there is evidence of flood plain farming. The chief aboriginal food plants were corn, beans and squash, and the Tewa’s also raised turkeys. The surrounding hills were covered with juniper which was used for firewood, and cottonwoods that grew along the Rio Tesuque were used for building. An excavation of the ruins of the Cuyamungué Pueblo was begun in June, 1952, by the Museum of New Mexico and the School of American Research. These excavations revealed that the Pueblo was first built around 1300. Different phases of construction indicate that the Pueblo was periodically occupied and abandoned, only to be reoccupied. The period of greatest population was from 1400 – 1500. The Rio Grande Historic Period begins with the first permanent Spanish settlement in 1598; however, the “Cuyamungueños” were probably seen by Captain Francisco de Barrionuevo, of Coronado’s army in 1541 and Castaño de Sosa in 1591. During the Historic Period, the people of Cuyamungué probably raised wheat and may have been introduced to fruit trees by the Spainards. In the year 1641, Nambé contained a church with Cuyamungué as a “visita” and a population of 300. In 1680, the Nambé population was 600 which probably included the “visitas” of Jacona and Cuyamungué. It is believed that the warriors from Cuyamungué took an active part in the 1680 Pueblo Revolt. When Don Diego de Vargas returned to New Mexico near the end of 1693, the population of Cuyamungué had greatly decreased, and two years after the Tewa’s surrender, the last remaining families of Cuyamungué moved away. The Spanish Land Grant System was significantly different from the Anglo-American concept of land ownership, and the deep conflicts that arose from these different perspectives. In the Treaty of Guadalupe at the close of the Mexican-American War in 1848, land that is now New Mexico, Arizona and California was ceded to the United States from Mexico. The residents of these territories were to be fully accepted as citizens of the United States, if they chose to be, and as citizens, they were accorded the full rights, liberties and protections guaranteed to all Americans. In addition, their property rights established under the previous sovereign were to be recognized and respected. New Mexico became a territory of the United States, and a Territorial Government was established. One of the most serious shortcomings of the new government was that it failed to recognize the political and legal rights of the rural Hispanic communities where the bulk of the population resided. Manifest Destiny exploded in this virgin territory, and the area and its people soon became prey of the Yankee merchants, land tycoons, ranchers and lawyers. Conflicts became rooted in two factors: land and water rights. With an act of Congress in 1854 the office of Surveyor-General of the Territory of New Mexico was created, and thus, the conflict escalated. The Anglo-American land tenure system is dependent upon conceptualizing the earth’s surface by use of an imaginary grid. Land becomes a precisely measurable entity, divisible into parcels located exactly on a paper map. This system is specifically not defined by earthly landmarks. To the Spanish settlers the tract of land called Cuyamungué was described in 1699 as follows: on the north the house of Lázaro Trujillo on this side of the river, on the south an arroyo, two mounds of Blue Stone and a cottonwood tree, on the east some hills and the road that leads to the Pueblo of San Francisco de Nambé, and on the west by some hills and forests on the other side of the Cuyamungué River. In the new Anglo-American land tenure system the same tract became Township 19 North of Range 9 East, Section 20 – Lots 1 and 2; Section 28 – Lot 4; Section 29 – Lots 1,2,3,4,5,6,7,8 (W 1/2 E 1/2). These new rigid, rectangular tracts of land totally ignored the old ways of the Spanish settlers. The old ways included communal pasturage and woodlands, kinship settlement patterns and community membership and access to water. In the old land system the vara was used. Community members with cultivated land which required irrigation had equal access to river or stream frontage. Each of these old tracts of land were long and narrow (the vara) with access to water versus a large rectangular plot so far away from a water source which then becomes virtually useless without irrigation. Furthermore, conveyance of privately held grant lands were rarely recorded only, and few found their way to the provincial archive. Under colonial and then Mexican law, transfers of privately held land could be made by verbal contract. This old established practice was to cause much loss of land for the Spanish settlers. With the creation of the Court of Private Land Claims in 1891, only claims with perfect paper titles from the Spanish and Mexican governments were recognized. The settlers also encountered the expense of filing claims, and most times they had to resolve their debts by exchanging land for attorney fees. Around 1696 the Pueblo of Cuyamungué (Cuyamongue) was abandoned and its lands were then occupied by Spanish settlers. 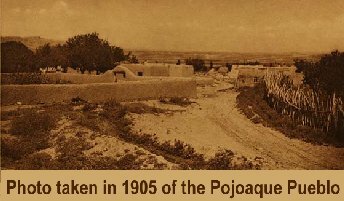 In 1699 Alfonso Rael de Aguilar, an officer in the Spanish army, petitioned then Governor Don Pedro Rodriguez Cubero for “six fanegas of maize planting land.” Cubero granted Aguilar’s request which included the old abandoned pueblo site. On September 24, 1704, Capitan Alfonso Rael de Aguilar made another petition to Governor Juan Páez Hurtado asking him to recognize the said six fanegas of corn planting land including the pastures, water, woods and watering places at Cuyamungué which were granted him by Cubero. Governor Domingo granted the lands and called upon the Chief Alcalde of Santa Cruz to notify the Indians of the Pueblo of Tesuque and the heirs of Juan Mestas and Lázaro Trujillo in order that they may make any objections at that time. This being done, Domingo Vigil, Lieutenant Chief Alcalde of the new village of Santa Cruz, examined the boundaries of said grant and took the said Bernardino de Sena by the hand, and conducted him over said lands. He pulled up “herbs” and threw stones and performed all other ceremonies as provided by law in proof of possession. The grant was for approximately 5,000 acres. On August 11, 1871, John W. Conway put forth a petition in the behalf of the heirs and legal representatives of Vicente Valdez and Juan Cristobal Romero, purchaser of the Cuyamungué tract. Samuel Ellison, the attorney for John W. Conway and his wife María de la Paz Valdez filed this petition with T. Rush Spencer, United States Surveyor General for the Territory of New Mexico. The petition asked the surveyor general to recognize the tract of land given to Bernardino de Sena et al in 1731. November 15, 1871, Surveyor General T. Rush Spencer issued a decree acknowledging the grant of Bernardino de Sena and his heirs. A transcript of all the papers in the claim were transmitted to the Congress of the United States. In October of 1877 a preliminary survey of the grant was made by Deputy Surveyors Griffin & McMullen. Their survey depicted the grant for only 1,086.30 acres much of which conflicted with the Pueblos of Pojoaque and Nambé. The grant petitioned by John W. Conway in 1871 and surveyed by Griffin & McMullen in 1877 was never acted upon by Congress, so María de la Paz de Conway and 21 other claimants filed suit in the Court of Private Land Claims on February 21, 1893. During the period from 1871 to 1893, and after, numerous protests were filed against the land grant. Jesús María Ortiz y Baca protested the 1877 survey as did the Pueblos of Pojoaque and Nambé. On October 24, 1895, the Court of Private Land Claims entered a decree in the favor of María de la Paz de Conway et al and confirmed the grant. Much of the said grant conflicted with the Pueblo lands of Pojoaque and Nambé, and on October 30, 1899, the U. S. Supreme Court reversed the PLC decree and ordered the land to be resurveyed. With a survey done by Jay Turley on November 20, 1900 the Cuyamungué Grant now contained only 604.27 acres of the original 5,000 acres. It was confirmed in May, 1901. The Cuyamungué Grant was finally patented on November 15, 1909, Patent #89309. However, a Warranty Deed made the 21st day of August in 1937 shows that Rebecca Conway (John W. Conway’s daughter) sold the Cuyamungué Grant back to the U. S. government for $2.00 an acre! The sale of the land was not consistent with the family’s persistence in acquiring this land, so why had Rebecca Conway sold this land back to the United States government? In 1935 the Resettlement Administration began purchasing lands in the Upper Rio Grande Valley for exclusive non-Indian (Hispanic) use for grazing. Cuyamungué was one of those repurchased grants. The dates match the Warranty Deed of 1937. The history of Cuyamungue: The Felicitas D. Goodman Institute land splits from the history of the Cuyamungué Land Grant around 1877 with the survey of Griffin & McMullen. This survey depicted a tract of land containing only 1086.30 acres of the original 5000 acres requested by Bernardino Sena et al. Much of that survey still conflicted with the Pueblos of Pojoaque and Nambé, and the final Cuyamungué Grant was patented for only 604.27 acres due to that reason. The portion of land excluded from the Griffin & McMullen survey became U.S. Forect Service land. Those 470.56 acres of Forest Service land were sold to Perley M. Lewis on July 18, 1962. Patent #258,340. A Warranty Deed was issued on April 1, 1964 for the sale of 278.56 acres to Glenn H. Goodman and his wife Felicitas D. Goodman. The same piece of land was then Quit-Claimed from Glenn Goodman to Felicitas Goodman in April of 1968. One last Quit-Claim Deed was issued on June 16, 1989, from Felicitas D. Goodman to the Cuyamungué Institute. The property remains in the hands of the Board of Directors of the Institute.